The following recording contains content which listeners/readers may find distressing. The City of Sydney Council recommends that the content should not be listened to or read by persons under the age of 18 years of age or those by those who are easily disturbed. By accepting and consenting to the following prompt you waive any legal actions against the City of Sydney Council which may be caused by exposure to the content. Robert Syron is a Birpai / Worrimi man. 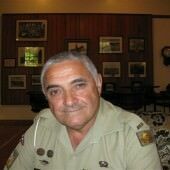 This interview is part of the ‘Honouring Aboriginal and Torres Strait Islander Men and Women who Served Their Country’ project. 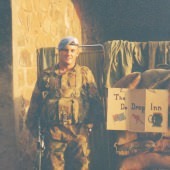 In this interview, Robert talks about his deployment to Rwanda in the mid-90s as part of a peacekeeping force, ostensibly providing security for the UN and other NGOs delivering medical support. It would take the Australian government another 10 years to re-classify the Rwandan operation as combat rather than peacekeeping. Listeners are advised that this interview contains graphic descriptions of war which listeners/readers may find distressing. The City of Sydney Council recommends that the content should not be listened to or read by persons under the age of 18 years of age or those by those who are easily disturbed. This interview with Robert Syron does not currently have an edited excerpt, but you can listed to the full interview here.